There are many scar treatment methods out there, but most people will likely desire getting a scar removal. Getting a scar removal will significantly reduce the appearance of a scar, however not completely remove it. Nevertheless, people usually get a scar removal performed if they want an unsightly scar removed from any part of their body. One of the ways to speed up the process of scar removal is to get a laser treatment. What is laser treatment? How is it performed? Laser treatments are generally used to remove scars covering the majority of a particular part on one’s body. This method, since it involves surgery, is considered if other scar removal methods don’t completely remove scars. During a laser treatment procedure, a trained professional directs a laser beam onto a scar and its corresponding surrounding area. The light used is a highly focused light energy beam, which removes the outer layer of one’s skin. This also gives the skin a fresher appearance. Over time the raw outer layer will begin regenerating skin on the surface, making the scar appear lighter and smoother in appearance. Laser treatments help stimulate the production of collagen underneath the layers of skin. 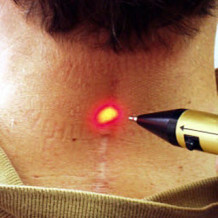 Based on the severity of a patient’s scar, they may have to undergo several laser treatment sessions. Am I a good candidate for scar removal through laser treatment? Despite the benefits, many people don’t actually qualify for the procedure. Some with fairer skin may get better benefits from the procedure than those with darker complexions. In addition, there are parts of one’s body that are darker than others, making it difficult for the skin to heal in a clean manner. If you have certain skin disorders, such as psoriasis or dermatitis, you won’t be able to get. What can I do to prepare for scar removal through laser treatment? When preparing for a laser treatment procedure, there’s a number of things you must undergo before heading to the office of a medical professional. Patients preparing for the procedure aren’t allowed to take drugs after getting laser treatment. It’s suggested one asks their medical professional questions about what one can and can’t consume before getting the treatment. If one feels self-conscious or concerned about significant scarring from the treatment, they should contact their experienced and certified dermatologist to figure out if laser treatment is the right option for them. Laser treatment may not cause complete scar removal, but it can make the scar and the skin surrounding the scar much smoother and lighter to the touch. Like many medical techniques, this treatment might not be for everyone.